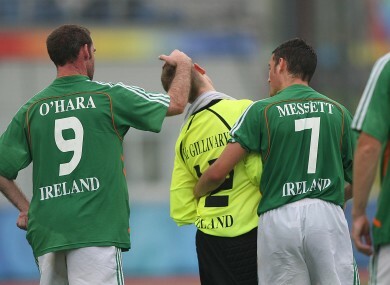 O'Hara and team mates during the Ireland / Iran match at the Beijing Paralympic Games 2008. A DUBLIN PARALYMPIAN footballer whose international caps were stolen from his home has appealed for them to be returned. Alan O’Hara, 37, from Portrane, Co Dublin, was knocked to the ground when two robbers broke into his apartment in the early hours of last Wednesday. O’Hara initially thought the intruders escaped empty-handed, but the next morning he discovered his three prized international soccer caps were missing from the mantelpiece. O’Hara said the caps are from when he represented Ireland in the 2004 Athens Paralympics, the 2008 Beijing Paralympics and the 2006 World Games in Connecticut. “The Athens cap is my favourite, as that was my best performance,” O’Hara, who is paralysed on his left side since birth, told TheJournal.ie. I was really proud to represent Ireland in the Paralympics so this has been a bit of a blow. I’m hoping whoever took them will return them. They’re not worth anything to anyone except me. O’Hara played football at club level for Portrane Athletic and St Ita’s when he was younger, and represented Paralympics Ireland over forty times between 2002 and 2008. His other international caps were in his mother’s house, he said. News of the robbery, which was first reported by The Northside People, comes just a day after Paralympian John McCarthy’s specially-adapted car was stolen from his driveway in Lucan. Gardaí retrieved McCarthy’s car today. O’Hara said he never believed something similar would happen to him. “You read about things like this happening to other people,” he said. You never imagine it will happen to you. Email “Paralympian footballer has international caps stolen in home raid ”. Feedback on “Paralympian footballer has international caps stolen in home raid ”.